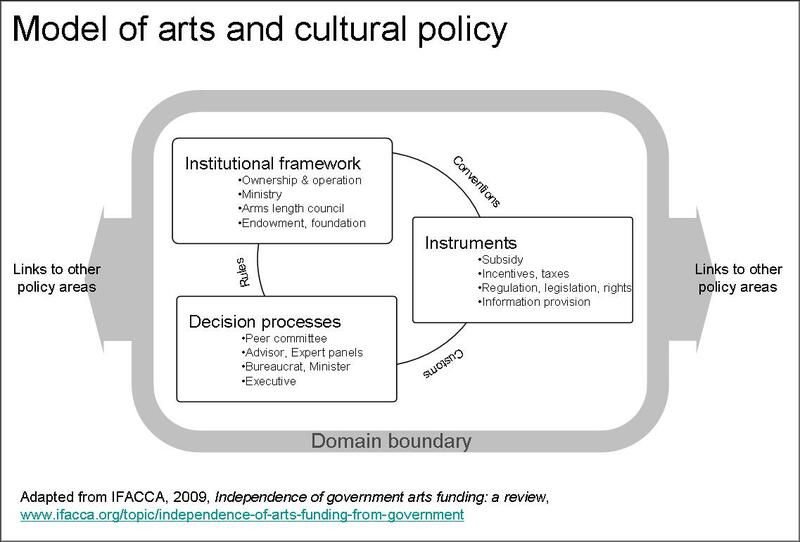 While I was at IFACCA, Sarah Gardner and I developed a model of arts policy that I find useful to keep in the back of my mind when thinking about the big policy issues. We developed it so we could get our heads around the issue of arm’s length funding and the independence of arts support, although the model can be used in all sorts of ways when thinking about arts policy. The model appeared in the IFACCA D’Art research report The Independence of Government Arts Funding: A Review, and builds on a review of a range of policy models that I won’t reproduce here, but which can be read in the paper. The most famous of these models is Chartrand and McCaughey’s facilitator-patron-architect-engineer model, but as the review in the D’Art report shows, there are a number of other approaches to modelling the arts policy ecology. Rules and customs that determine the interaction of the above elements. I have adapted the model further into the diagram below (click to view full image).